The plastic included 16 rice sacks, four banana plantation bags and multiple shopping bags, according to a local museum. 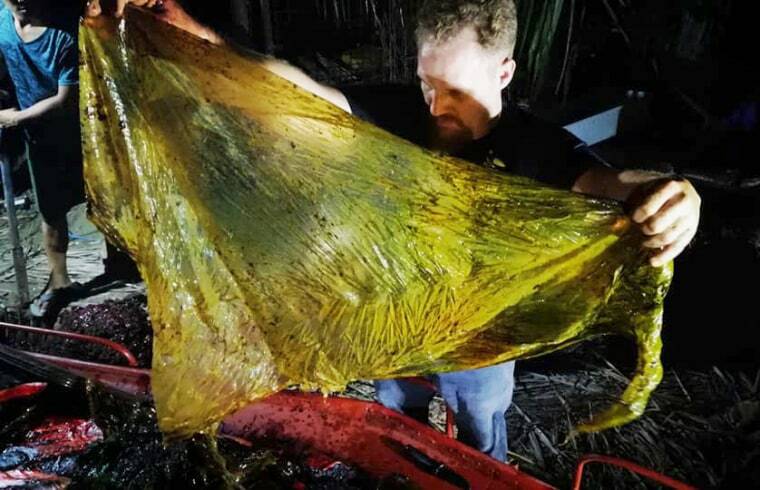 Darrell Blatchley, director of the D' Bone Collector Museum, shows plastic waste found in the stomach of a beaked whale on the southern Philippine island of Mindanao on March 16, 2019.Courtesy of D' Bone Collector Museum Inc.
With millions of tons of plastic ending up in the world's oceans every year, it's not unusual for marine wildlife to ingest some of it. But a museum in the southern Philippines said it made a stomach-churning discovery on Saturday when a beaked whale measuring more than 15 feet long was found dead with 88 pounds of plastic still lodged inside of it. The creature was located off the coast of the Mabini Campostela Valley. "I was not prepared for the amount of plastic," Darrell Blatchley, president and founder of the D' Bone Collector Museum in Davao City, told NBC News in a statement. The plastic included 16 rice sacks, four banana plantation bags and multiple shopping bags. It was the most plastic ever found by the group inside of a whale, said the museum, a nongovernmental organization that retrieves dead animals and preserves them for educational purposes. The male Cuvier beaked whale died from ingesting plastic waste.Courtesy of D' Bone Collector Museum Inc.
"It was so bad the plastic was beginning calcification," Blatchley said of the process in which calcium builds up in the body and causes tissue to harden. After a necropsy, Blatchley said, the animal appeared to have died from emaciation and dehydration — with the plastic hindering its ability to eat or drink. The whale had also been vomiting blood before it died, he added. Images of the whale have gone viral worldwide, as more and more people are calling for bans on single-use plastic, often focusing on its effects on the ocean. An estimated 8.8 million tons of plastic spill into the ocean annually. In the Philippines, Blatchley said, it's particularly bad. Over the past 10 years, his group has recovered 57 dead whales and dolphins, many of which died from plastic ingestion. "The Philippines needs to change," Blatchley said, adding that he hopes the latest attention on the whale will shine a light on the effects of pollution before "nothing will be left."